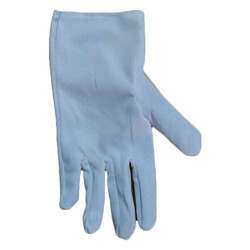 We are the prominent company that is engaged in providing high quality range of Industrial Hand Gloves. 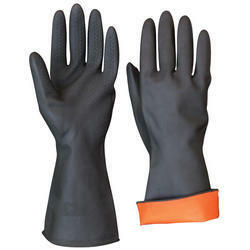 We are manufacturer of all type industrial gloves. We are engaged in manufacturing of best quality Rubber Gauntlet at the reasonable price. Product Use: Protection against small splashesh of liquid gas upto 1700 C .
A welding glove made of hard-wearing, heat resisting chrome leather, fully lined and KEVLAR stitched. This glove is used for MIG/ MAG/MMAwelding. Anti-Cutting Gloves: :The high performance anti-cutting gloves are made of high tenacity high modulus PE fiber and spandex fiber, which is weaved by high-density computerized glove knitting machine and is treated on glove surface with PU resin coating. In order to meet various demands of our esteemed clients, we are engaged in manufacturing an optimum quality array of Leather Hand Gloves.